At what stage does a camera cease to record ‘real’ images and instead present the photographer something that has been ‘photoshopped’ before even being considered as ‘post production’? Is this photography, or is it a fraud? What brought this to mind was the fact that Panasonic have launched a camera that can brush up, clean up and even put make-up on the subject’s face. 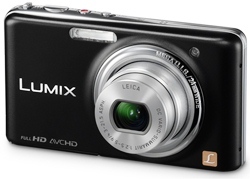 Through their Lumix division, the Panasonic FX77 has a “beauty re-touch” function that will whiten teeth, increase the translucency of the subject’s skin, remove dark eye circles, make the face look smaller and even magnify the size of the eyes. If that is not enough to make the subject look beautiful, then the camera has an application that will apply rouge, lipstick and even eye shadow. The development of this technology is supposed to have come about after Panasonic listened to their clients and found out that a reputed 50 percent were not happy with the way they look in photographs. The phrase “Truth hurts” comes to mind! According to the Panasonic blurb, the FX77 comes not only equipped with high performance but also with a host of entertainment features that adds fun to photography such as new Beauty Retouch, Art Retouch and My Photo Album. With the newly integrated Lumix Image Uploader the photographer can instantly share the enhanced images via Facebook or video to YouTube (movie) with any PC on the spot. All you have to do is checkmark the photos you want to share and connect the camera to a PC. Uploading starts just by following the simple instructions, allowing you to add a comment and notify your friends via e-mail. Facebook can be used for photos and YouTube for movies. The camera was released through the Bic photo chain in Japan and they reported that these features made it a great hit with consumers. “It’s very popular among people who use pictures in their blogs, or those taking just one commemorative photo that they need to be flawless,” said Hiromi Honma, a Bic Camera sales representative. Looking at this camera’s photographic features, “The FX77 features a new high quality Leica DC Vario-Summarit 24 mm ultra wide angle lens with 5x optical zoom and F2.5 brightness. This lens will excel not only in shooting landscapes with its wide angle of view but also in capturing moving subjects even in low-light situations such as indoors or at night with its outstanding brightness. Comprising seven elements in six groups, including three aspherical lenses with five aspherical surfaces, the lens unit in the FX77 is miniaturized both in total length and diameter to fit into a slim and compact body. “Panasonic and Leica have had a good association in the past and this advanced lens passes Leica’s stringent standards to deliver exceptional optical performance right to the edge of the frame. Thanks to the newly incorporated Intelligent Resolution technology, Intelligent Zoom is available with the FX77 which extends the zoom ratio by approx. 1.3 times whilst maintaining the picture quality even when combined with the digital zoom. This means the 5x optical zoom can virtually extend to 6.5x equivalent. The Extra Optical Zoom function extends the zoom power to 9.8x (at 3 megapixel resolution) by using the center part of the 12.1 megapixel high resolution CCD – bringing subjects even closer. The compact lens unit contributes to a slimmer, sleeker profile compared with previous Lumix FX models” and is apparently the most luxurious ever Lumix compact camera. All these new technology features are remarkable, packed into a compact camera, but I am not sure about the Beauty Retouch and Art Retouch applications. This is just one step away from getting someone else to sit for your portraits. There is a difference between avoiding showing portrait problems and straight out lying with a camera. I would not recommend this camera.